“Countless opportunities lie ahead to improve the quality of working lives, expand choice, close the gender gap, reverse the damages wreaked by global inequality. Yet none of this will happen by itself. Without decisive action we will be sleepwalking into a world that widens existing inequalities and uncertainties,” according to a report by the International Labour Organisation released this week in Geneva in preparation for its 100th anniversary which will be celebrated later this year. The report was compiled by the ILO Global Commission on the Future of Work, co-chaired by South African president, Cyril Ramaphosa and the Prime Minister of Sweden Stefan Löfven. President Ramaphosa addressed the ILO meeting upon release of the report. The Future of Work makes ten recommendations to governments, which are envisaged to have far-reaching consequences for the global labour force, ensuring that the working environment functions for the benefit of humans. * A universal labour guarantee that protects fundamental workers’ rights, an adequate living wage, limits on hours of work and safe and healthy workplaces. * Guaranteed social protection from birth to old age that supports people’s needs over the life cycle. * A universal right to lifelong learning that enables people to skill, reskill and upskill. * Managing technological change to boost decent work, including an international governance system for digital labour platforms. * Greater investments in the care fo workers, in green economies and in rural economies. * Reshaping business incentives to encourage long-term investments. The Future of Work report outlines the challenges caused by new technologies, climate change and demography and calls for a collective global response to the disruptions they are causing in the world of work. The report is the culmination of a 15-month examination by the 27-member commission, comprising leading figures from business and labour, think tanks, academia, governments and non-governmental organizations. 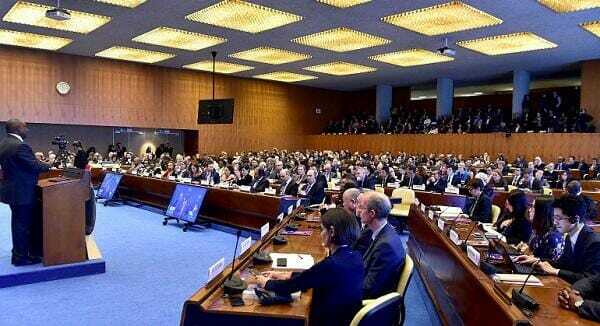 “The ILO Global Commission Report on the Future of Work is a vital contribution to global understanding of the changes occurring – and that will continue to unfold – in the world of work,” President Ramaphosa told the ILO meeting. “The report should stimulate engagement and partnerships within and between national and regional jurisdictions to ensure that the global economy and global society becomes more equitable, just and inclusive. At the same it should inspire global action to contain or eliminate challenges that humanity has inflicted on itself in the course of history,” he continued.